The LENS 860 system, with its AM or hybrid AM/CNC metal versions, brings new industrial power; an existing version has already supported developments in dissolvable implant design. The LENS 860 Hybrid CA system, featuring an 860 x 600 x 610mm work envelope, is equipped with a hermetically-sealed build chamber that maintains oxygen and moisture levels below 40 ppm for processing reactive metals such as Titanium. The system can be configured with closed loop controls and a high-power 3kW fiber laser, making it ideal for building, repairing or coating mid- to large-size parts with superior metal quality. Image courtesy of Optomec. 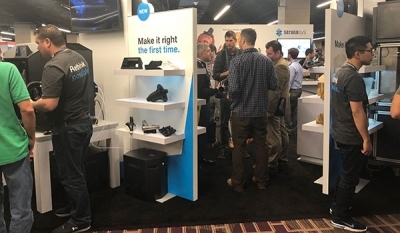 Perhaps the best way to get customers excited about a new additive manufacturing (AM) system is to demonstrate successful applications done on the equipment’s sibling models and then highlight the expanded capabilities. Last month at IMTS, Optomec did just that, displaying its large format LENS 860 system while featuring a unique medical application developed on the smaller but powerful LENS 500 model. 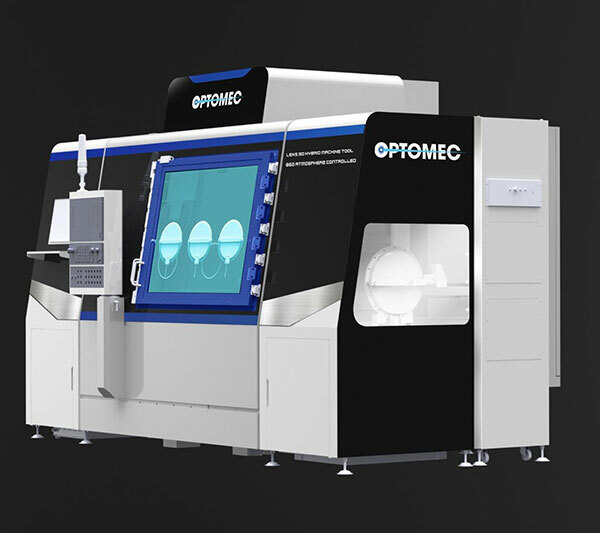 With the launch of the LENS 860 Hybrid Controlled Atmosphere (CA) system, Optomec has broadened its Machine Tool Series — first announced at IMTS 2016 - to offer higher laser power, a larger build volume, double the tool carousel size and options for 4/5-axis as well as simultaneous 5-axis operations. 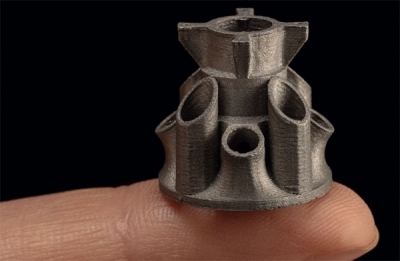 LENS (laser engineered net shaping) technology supports additive manufacturing using any metal powder source and operates with either open or controlled atmospheres (for processing reactive metals). 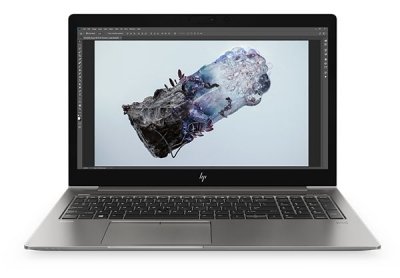 This newest version provides a wide range of options for users to build new parts, repair or coat damaged/worn parts and perform hybrid AM/CNC functions. The standard 3-linear-axis motion configuration of the LENS 860 can be upgraded to work with a user-interchangeable rotary table and/or tilt-rotate trunnion for 4-axis, 5-axis and simultaneous 5-axis processing. For use in the hybrid (additive/subtractive) configuration, the new tool changer turret holds 16 tools compared to the 8 offered in the smaller LENS system. CNC users will find the MasterCAM programming software and Siemens 840D controller offer a familiar Windows interface, and the choice of open or controlled atmosphere operations supports working with metals ranging from steel/stainless steels and nickel-based alloys like Inconel to reactive metals like titanium, aluminum and magnesium (see below for new application research). Configured with up to four powder feeders, the print-engine works with powders from standard metal-powder suppliers, both lowering the price of materials and speeding up the build. Users can build parts quickly from a single material or mix functionally graded metals throughout a part as it builds, without stopping. For example, says Cobbs, you can start with carbon manganese and end with stainless steel; no other technology has this function. In an interesting comparison study performed by Optomec several years ago, the company also demonstrated faster build speeds compared to powder bed fusion (PBF) technology. Another major enhancement in the new systems is optional closed-loop melt-pool monitoring achieved with a combination of IR/thermal and optical sensors. Cobbs explains, “During a build, the heat transfer to a very cold, thick (build) plate of steel is going to be very different than when you’re on layer five or layer ten, or you’re doing a thin wall; those layers are being tempered more and warming up more. 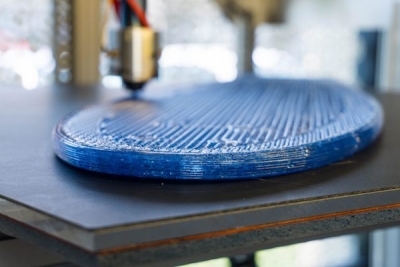 You’re looking at possibly very different material properties between those layers.” The melt pool sensor takes measurements and the feedback loop controls laser power layer by layer, providing more consistent material properties. An interesting research project recently begun at the University of Nebraska – Lincoln (UNL) involves slowing down the dissolving rate of magnesium medical implants, which are now being used mostly in the form of orthopedic repair screws. These screws are intended to dissolve, taking advantage of interaction with body chemistry over a period of months as natural bone ingrowth takes place. This process can be preferred to having surgery with stainless steel, titanium or cobalt chrome hardware, which may become bothersome over time as a permanent implant. 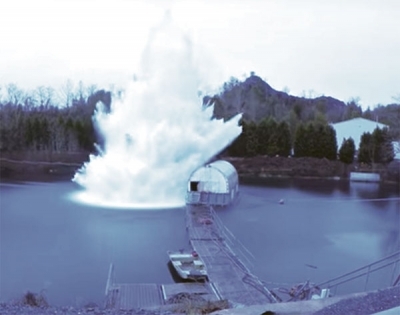 The problem is that magnesium generally dissolves too quickly. So, current implants get a protective chemical coating that itself dissolves slowly – essentially, a corrosion-resistance treatment; however, once that surface treatment is gone, the rest of the implant dissolves faster than is generally desired while the bone is still healing. 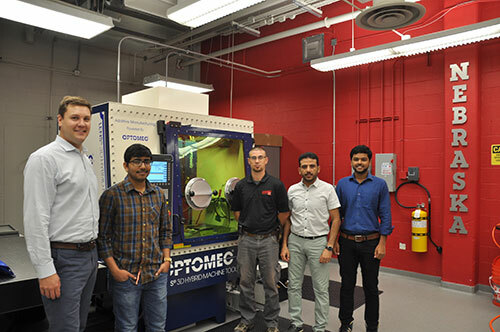 Students from the University of Nebraska-Lincoln (UNL) along with Professor Mike Sealy have been using a LENS metal hybrid additive manufacturing system from Optomec to advance research into key areas such as heavy machinery, medical devices and aeronautics. Sealy and his team are pioneers in additive manufacturing research and have established the Nebraska Engineering Additive Technology (NEAT) Labs as a state-of-the-art regional hub for innovation that enables collaboration among academia and industry. Image courtesy University of Nebraska-Lincoln. To address this issue, Michael Sealy, professor of mechanical and materials engineering at UNL, has spent the last two years using a LENS 500 hybrid controlled-atmosphere system to research alternative, essentially mechanical treatments that slow this effect. He has built proof-of-concept 420SS test coupons and treated them, layer by layer, with laser peening. * Compared to standard shot peening, which has a limited depth of penetration, laser peening involves a high-temperature plasma which generates tightly focused shock waves; these in turn produce a mechanical peening effect on the part’s microstructure that can go as deep as 6mm in some materials. With magnesium samples, Sealy has found the penetration to go between 500 microns and 1 mm, but this could go deeper depending on the laser. 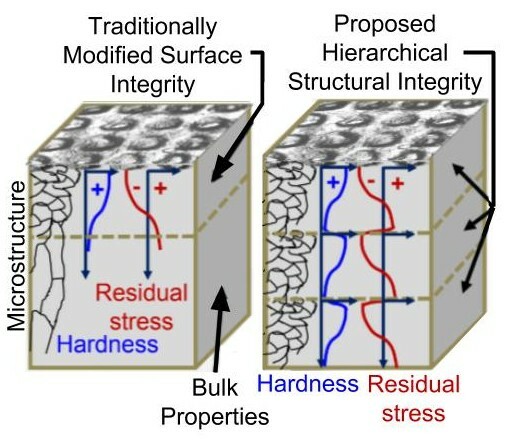 Diagram showing how layer-by-layer laser peening of an additively manufactured part exhibits changes in microstructure that produce tailored residual-stress behavior. Image courtesy University of Nebraska-Lincoln. 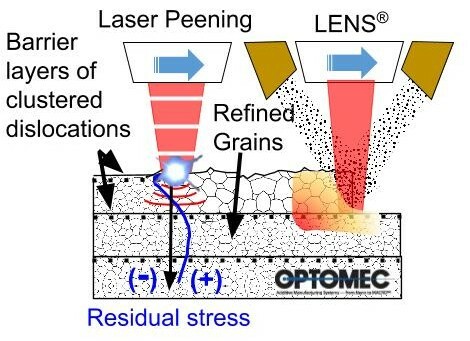 Diagram showing the progressive steps of depositing a metal layer with Optomec’s LENS Hybrid Controlled Atmosphere AM system then treating the newly formed surface with laser-peening to induce distinct microstructure changes. Image courtesy University of Nebraska-Lincoln. Since peening refines the magnesium’s grain structure and modifies the residual stresses, the effect is to slow down what would normally be thought of as corrosion or fatigue effects. 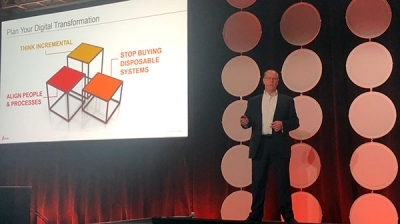 Sealy realized he could use the controlled-atmosphere LENS process to build test coupons layer by layer and separately treat the surface of each layer after it is deposited (using external pulsed laser-peening equipment). This approach adds corrosion resistance throughout the part instead of just on the exterior, as with coated screws. 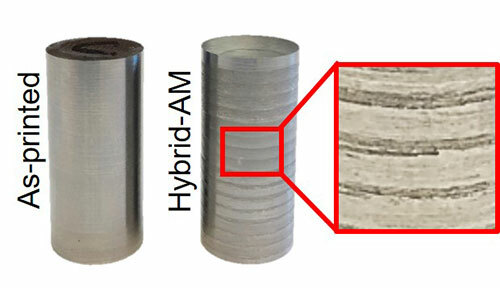 Samples of 420 stainless steel built on an Optomec LENS Hybrid Controlled Atmosphere AM system, with and without laser-peening between layers to create tailored residual stresses. Image courtesy University of Nebraska-Lincoln. 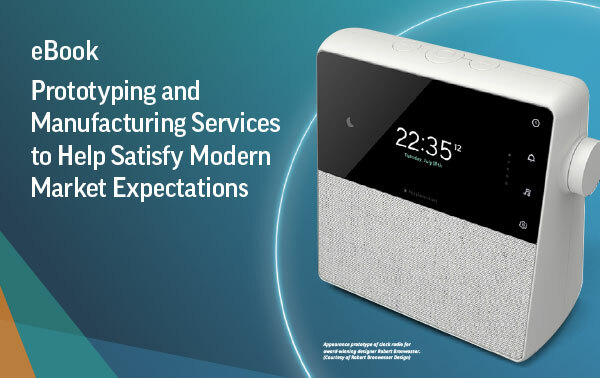 Sealy’s R&D efforts are now addressing such questions as, does laser peening need to be performed after every layer is deposited, or will the dissolve-rate be sufficiently slowed down if every fifth one is treated? Or perhaps peen two layers then skip two layers? It may be very application-dependent as well as AM-technology dependent (e.g., LENS versus powder bed fusion) and also differ if the focus is corrosion, fatigue or other areas of interest. 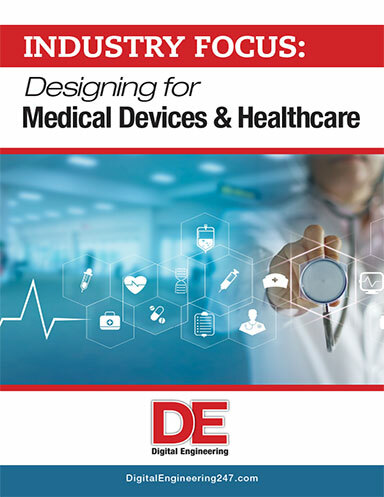 In addition to improving the performance of medical implants, this research can go in many directions. Sealy says you could fill up a career with these possibilities, addressing other areas such as light-weighting structures and fatigue resistance, although he has a personal connection to the magnesium-implant work: he has had two permanent metal screws in his elbow since childhood, and they are beginning to bother him. It would be great if there were more ways to use magnesium hardware for surgery, adding support that would quietly disappear when bone growth had completed its work and not requiring secondary removal surgery.